We highly value young children and strongly believe in listening to them; not just their voices but their body language too. We draw our inspiration from a variety of theoretical approaches developed here in the UK as well as influences from further afield. Hove Village Day Nursery is an exciting and unique setting in Hove. 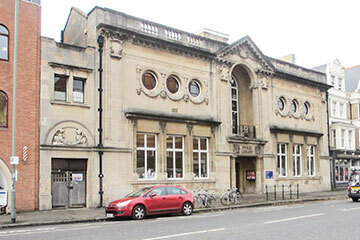 We are also about to open our second setting - a Pre-School at the historic Grade II Listed Hove Library. Our New Church Road Nursery is situated in a beautiful Victorian building next to the very popular Wish Park, we are fortunate to have the beach and Hove Lagoon at the end of the road. Our spacious nursery offers light and bright rooms for each age group and a well-equipped garden with outdoor classroom. Creativity is at the heart of everything we do as our founder spent 18 years delivering a programme of music and art-based education classes to over 150,000 children across the U.K. and Europe. We also appointed a new management team in Autumn 2018, who each have over 10 years experience managing succesful nurseries (read more about our management team, our founder and our people). Children enjoy music, dance, yoga and art classes with specialist teachers in our own creative studios, and also enjoy both our sensory room and soft play areas. Additionally, we have introduced discovery and exploration rooms for children to inspire learning and creativity within beautiful environments. The nursery is easily accessible as we are very close to bus and train routes and we have free on-street parking just outside. We are a very forward-thinking nursery where children are are always our focus. As a parent or carer you are able to share your child's day using our brilliant app. Our Educators and Management team are always available and are just a visit, phone call or message away to answer any questions. 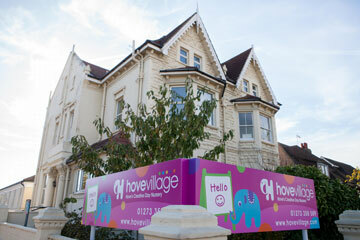 Our brand-new pre-school and nursery at the historic Hove Library is now taking registrations. This new setting is very fortunate to share the building of this local treasure. Children will not only have access to a huge range of resources within the new nursery, but will also benefit from the great facilities offered at the library, including the wonderfully equipped children’s library. The space we occupy is a bright and airy unique hemicycle, with windows flooding light from our private garden into our wonderfully designed spaces. Read more here. We are open 07:30-18:30 Monday-Friday, all year round. We only close for Bank Holidays and for a few weeks over the Christmas and New Year period. Our sessions offer a great deal of flexibility, with full-time, part-time and sessional care available. We offer a choice of full-day, half-day or school-day sessions, so you can choose the combination which works best for you and your child. Our fees are all-inclusive and we offer flexible options for payment, including all of the main childcare voucher schemes, Tax-Free Childcare and free entitlement (both 15 and 30 hours). Find out more here.